Staples appends his forays into street life with thoughtful meditations on what he is saying and where he has come from. To describe Vince Staples' ascension in the world of contemporary hip-hop as "meteoric" would be an understatement. Since his 2015 debut album, Summer '06, the Long Beach rapper has appeared on recordings by groups as disparate as RagnBone Man, to The Gorillaz, as well as being a beloved guest on tracks from Compton's Kendrick Lamar, Harlem's ASAP Rocky, and Oakland's own E-40. His voice has been a touch-stone for several pieces of current cinematic history by being included in soundtracks from Creed (2015), Black Panther (2018) and Into The Spider-Verse (2018). Along the way, he's been interviewed by the likes of NPR and The Daily Show With Trevor Noah, where he has proven himself to be a charismatic and savvy commentator on his career, offering insight through musings about the maddening nature of fame, the importance of being grounded in personal history, and, well, not taking sh*t from anyone. 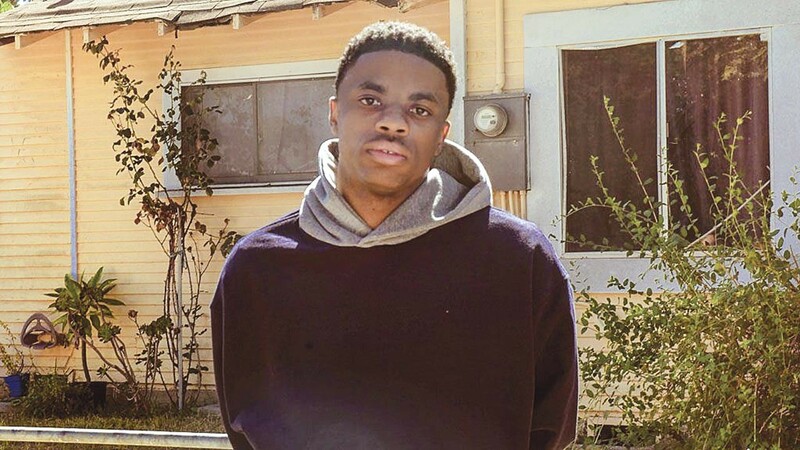 Even as the Def Jam rapper's second album, 2017s Big Fish Theory, debuted at 16 on the charts, outside of some very informed "heads" in the hip-hop world, it seemed that everyone had heard Vince Staples yet few had actually heard of him — or really listened to him — until last year. Beginning with his premiere guest spot on Elimination Chamber (2012) by Domo Genesis and Alchemist featuring Earl Sweatshirt and Action Bronson, Staples' unique flow and his overall sensibilities have enabled him to surround himself with equally-talented, like-minded artists. His verbal pacing can oscillate between a slow Southern drawl, probably left-over from his years attending high school in Georgia, and an increasingly more layered and complex rapid-fire braggadocio and being featured by Alchemist, best known as one-third of The Dilated Peoples, indicated that Staples had a gift worth noting, and was a person worth knowing. What distinguishes Staples is something of a mystery, at first. In a genre of music notorious for creating and promoting outlandish caricatures covered in gold, braids and tattoos, Staples' usual uniform is a white t-shirt name-checking rock or punk bands like Nirvana or Sublime, a pair of jeans hiked up the waist, and some non-descript, though clearly expensive, sneakers. Though often in-front of a camera and comfortable there, Staples has made it clear that he has no interest in celebrity and, unlike most of his contemporaries, had not planned on becoming a rapper at all. He seems to reject all of the outward trappings of the hip-hop world, including the alcohol and drugs being constantly referenced in the music right now. Staples has declared himself to be "straight-edge," embracing the old punk term for those who do not partake in alcohol or illicit drugs. This may be the reason why he chose to become a spokesman for Sprite when other hip-hop artists have chosen to represent brands of vodka or whiskey. His best known song at this point, "Norf Norf," begins with the line "B*tch you thirsty/Please grab a Sprite," in a not-so-subtle endorsement of the lemon-lime soda. Ultimately, what makes Staples a stand-out among stand-outs is his lyrical ability to express insight that many consider wise beyond his years. Staples has said he does not believe that wisdom is something that comes with age. In a recent interview with NPR he asked, "What's the appropriate amount of years to have that insight?" His songs and accompanying videos are constant interrogations of not only the flashy world of hip-hop, but the dark, gritty and, and sometimes frighteningly absurd world all around him. His epic 10-minute mini-movie Prima Donna mixes images of Vodun Orishas with tropes from horror movies, while Staples lyrically eviscerates a culture that consumes his inner and outer turmoil, his literal thoughts of suicide, as entertainment. "Seem the music interchangeable/Raging bull, what you headed for?/Heaven doors, or hell below/I write directions for the road to let you know/Edgar Allen Poe/Tried to warn 'em of demise and all he seen was crows," evoking not only Poe but Bob Dylan and William Blake as well. Staples' distinguished rise has all the markings of a genius at work. Hindsight being 20/20, it always has.